It has been rocked by earthquakes, pillaged by treasure hunters, bombed by terrorists and pummelled by volcanic eruptions, yet the single, largest Buddhist structure on earth endures. This is Borobudur: a 1200-year-old Mahayana Buddhist temple that rates as Indonesia’s most popular tourist attraction. You’ll find on the island of Java, about an hour’s drive out of Yogyakarta. This imposing stone monument lures more than three million visitors every year, many of whom arrive before dawn and fork out around AUD$40 to watch the sun cast its first rays over Borobudur. Lounging in the darkness, propped against a circle of intriguing bell-shaped stupas, the morning’s small crowd shifts restlessly, aiming cameras and iPhones east towards a sun still tucked below the horizon. A ribbon of cloud obscures the sun as it rises, lightening the sky and igniting intricately etched stone panels that minutes before were indistinguishable in our torch beams. We circle Borobudur’s upper terraces and peer inside those famously latticed stupas that hide 72 stony faced Buddha statues, delighting when we discover one entirely intact. Until the gates open to the masses, we sunrise viewers have Borobudur all to ourselves. Built during the 8th and 9th centuries and abandoned to the ravages of the jungle soon after, Borobudur was largely unknown to the world until British Governor Thomas Stamford Raffles ‘rediscovered’ it in 1814. 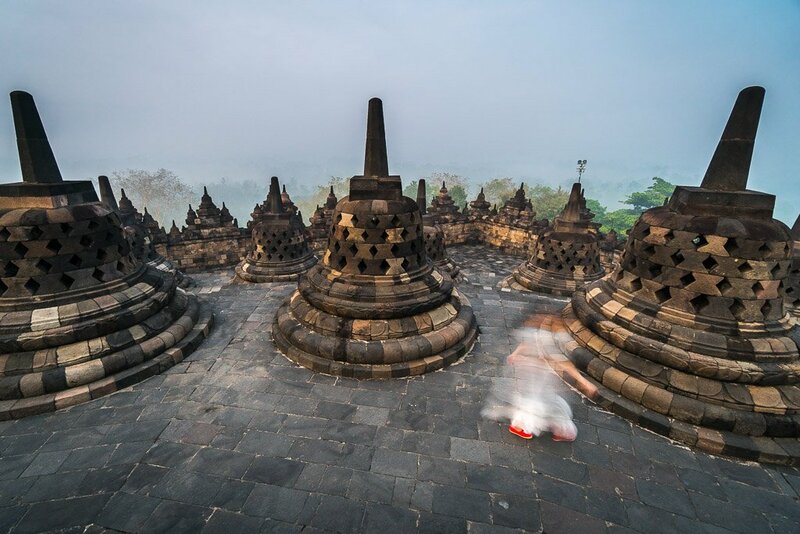 Unearthing the site began under Raffle’s direction soon after, but it took a decade-long, US$25-million dollar UNESCO restoration project for Borobudur to earn its World Heritage status. The challenges were huge. To repair the 10-tiered monument’s waterlogged foundations, almost the entire structure was dismantled – stone by stone – and rebuilt from the ground up. The ancient Borobudur temple in central Java. A buddha statue in its bell- shaped stupa, protected by the original perforated chambers. As the sun rises higher we explore Borobudur’s lower flanks where 432 Buddha images grab my attention, punctuating 1460 narrative panels telling tales of ancient Javanese life. By the time we wind our way back to the ground and circle this imposing monument one last time, an influx of tour groups breaks our relative solitude. We move on in search of coffee, detouring for a fleeting stop at a nearby archaeological museum where row upon row of original monument stones has us wondering how they fit into the picture? Teamed with a classic Indonesian breakfast of deep-fried banana and sticky rice, the coffee is included in our rather overpriced entry fee, but it’s a nice add-on which we devour at umbrella-covered tables at Manohara Hotel just inside Borobudur’s gates. Historically significant and archeologically fascinating, Borobudur is one of a kind but don’t expect the grandeur of Angkor Wat or the diversity of Bagan’s endless sea of temples. It’s a small, hugely popular site that provides little elbow-room at dawn, but even so, rates as one of the best tourist sights around Yogyakarta, and one of Java’s top sunrise spots. My advice: forget about the price tag, join the throng and pray for a great sunrise. Borobudur is located at Magelang, about an hour’s drive from Yogyakarta by shared taxi (simply book at your hotel, from Rp 80,000/person). Sunrise entry for foreigners (4.30am) costs Rp 40,000 (around AUD$40), while general entry tickets (from 6am-5pm) costs Rp 280,000, half-price for students and is free for kids under five years. Sounds like this monument is worth getting up really early for with the added bonus of seeing it in first light, with just a few others.